Ibn Battuta Residences ... 531 luxury apartments. A number of multi-tower complexes and iconic twin-tower projects were in the limelight at Nakheel’s stand at last month’s Cityscape Global expo in Dubai, UAE. The Dubai-based master developer aims to double its leasing stock to more than 36,000 units over the next five years as it grows its residential and retail portfolios in the UAE emirate. Nakheel’s new projects include the 42-tower Jebel Ali Gardens and 20-tower community at Deira Islands, the twin-tower Palm 360 and Ibn Battuta Residences, as well as a retail development at Nad Al Sheba. The developer is also building new homes for lease at Jebel Ali, Nad Al Sheba, Palm Jumeirah and Jumeirah Heights, adding to its existing stock at The Gardens, Discovery Gardens, International City and Jebel Ali Village. For the new Dh7.5-billion ($2.04 billion) Jebel Ali Gardens community, Nakheel is drawing on the talent and expertise of home-grown engineering and architectural consultants to help deliver the project. It has tasked six Dubai-based, Emirati-led companies with overseeing the design and construction supervision of the sprawling development, where 42 towers will house 40,000 people in nearly 10,000 apartments. The companies that it has selected include Meecon (Middle East Engineering Consultants); Golden Square Engineering; Adnan Saffarini Office; Arif and Bintoak Consulting Architects and Engineers; Design Centre Architects and Engineers Consultants; and Bel-Yoahah Architectural and Engineering Consultants. A construction tender will be released in Q1 2017, with completion anticipated in Q1 2020. Work has started on the 20-tower community at Deira Islands. He says these six firms will work with Nakheel’s in-house design, engineering and construction teams to deliver what is set to become one of Dubai’s largest, most desirable residential communities. Designed for people wanting quality, affordable accommodation with convenient community facilities, Jebel Ali Gardens is set on a 5.5-million-sq-ft site – of which around 20 per cent will be communal green space – with a built-up area of 19 million sq ft. 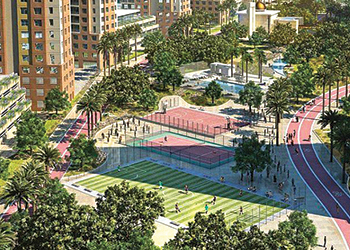 The 10,000 apartments, ranging from one- to three-bedroom units, will be set in more than a million sq ft of lush, landscaped gardens featuring a central park, swimming pools, jogging track, football fields and tennis and basketball courts. There will also be three mosques that can accommodate up to 3,000 people between them. The 42 buildings, ranging from 18 to 29 floors, will be grouped into 12 blocks, each featuring a gym. There will also be ground-floor retail space in each building. Meanwhile, work has commenced on 20-tower community at Deira Islands, a 15.3-sq-km waterfront city in Dubai. The Dh5-billion ($1.36 billion) Deira Islands Boulevard, which encompasses 16 residential buildings, two hotels and two serviced apartment complexes, will transform the skyline at Dubai’s newest living and leisure hotspot. 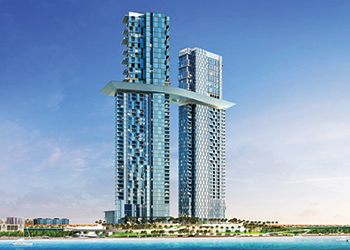 Nakheel has appointed global design consultants AE7 to oversee the design, engineering and construction supervision of the project, which is set for delivery in Q2 2020. A construction tender will be released in Q1 2017. Set over a nine-million-sq-ft area, Deira Islands Boulevard will surround Deira Mall, Nakheel’s 6.5-million-sq-ft shopping, dining and leisure destination. Between them, the 20 towers will contain nearly 2,900 apartments and townhouses for lease as well as around 1,000 hotel rooms and serviced apartments. “Deira Islands Boulevard will be the defining landmark of the area traditionally known as ‘Old Dubai’, offering spectacular facilities in a self-sustaining community for more than 10,000 people. 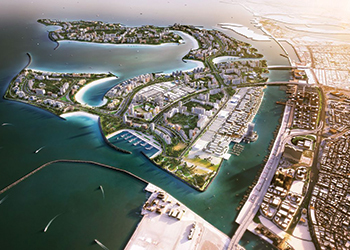 The project is one of a whole range of world-class attractions that we are creating at Deira Islands, which is set to become the new destination of choice for living, tourism and recreation,” says Lootah. The project will boast 1.7 million sq ft of green, communal parkland featuring landscaped gardens, shaded walkways and a host of sports and well-being facilities. Palm 360 ... an iconic project. Taking centre-stage at Nakheel’s stand at Cityscape Global was Palm 360, an iconic, twin-tower hotel and residential project on The Palm Jumeirah’s western crescent featuring branded penthouses that offer the ultimate in luxury living. The project, which is anticipated for delivery in mid-2020, includes two boutique hotels with 110 rooms between them. Residences include 252 high-end one- and two-bedroom serviced apartments and 12 four-bedroom ultra-lavish penthouses, including six covering an area of 12,000 sq ft – equivalent to the size of four tennis courts. Each occupying an entire floor – or two floors in the case of the duplexes – the penthouses boast unrivalled facilities such as a private infinity pool, gymnasium and home theatre. Soaring more than 220 m above The Palm Jumeirah, Palm 360 – as the name suggests – offers all-round, uninterrupted views of the island, the Arabian Gulf and the Dubai skyline. Its unique features include a rooftop infinity ‘sky pool’ and specialty restaurant complex connecting the two buildings at the 30th floor, more than 170 m above ground. At 135 m, the pool is longer than a football field. There will also be two further pools located above a range of beachfront restaurants. The hotels – occupying the first nine floors of each tower – will both feature an all-day restaurant, specialty restaurants, a luxury spa, health and fitness centre and a lobby-level indoor garden with floor-to-ceiling glass doors that will open onto a vast terrace during winter. Another a new landmark twin-tower complex unveiled by the developer is the Ibn Battuta Residences consisting of two 48-floor buildings with 531 luxury apartments. 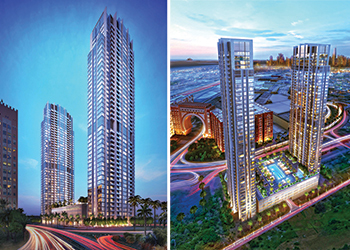 The towers are anticipated for delivery in Q4 2019. Offering extensive sea and city views, Ibn Battuta Residences will comprise 395 two-bedroom and 136 three-bedroom apartments, some with balconies and a maid’s room. There will also be a podium-level health and recreation complex featuring a landscaped pool deck complete with pools and a gym, as well as four levels of car parking with 900 spaces. Located just off Sheikh Zayed Road, the residences will be adjacent to the Ibn Battuta Mall, providing on-the-doorstep access to more than 400 shops, restaurants and entertainment facilities. According to Lootah, Ibn Battuta Residences are the highest standard of accommodation available in Jebel Ali and are ideally placed for people who work at the nearby Jebel Ali Free Zone or Dubai South, and, being less than an hour by car from Abu Dhabi, offer a convenient address for those who regularly travel to the capital. The residences complement a major expansion under way at Ibn Battuta Mall, where Nakheel is adding hundreds of shops, a new cinema complex and two hotels – the first of which will open next month – to the existing retail and leisure hub. Jebel Ali Gardens ... to be built using local talent. Among other developments, Nakheel is adding another mall to its Dh16-billion ($4.35 billion) retail project portfolio, with a 1.2-million-sq-ft shopping, dining and entertainment hub at Nad Al Sheba. The company, which now has almost 17 million sq ft of retail space in operation or in the pipeline, will build the regional mall at its upcoming Nad Al Sheba master community, where 1,500 villas are currently under construction. Nakheel has appointed AE7 to oversee the design, engineering and construction supervision of Nad Al Sheba Mall, which will have 500,000 sq ft of retail space. A construction tender is expected to be released in Q4 2016. One of 15 large-scale existing or forthcoming Nakheel retail projects, Nad Al Sheba Mall will feature around 200 shops, restaurants and entertainment outlets including a supermarket, department stores, multi-screen cinema, medical centre and fitness centre. Lootah says: “Nad Al Sheba Mall is the latest addition to our rapidly-expanding retail project portfolio, which will see the delivery of 13 million sq ft of leasable space in the next three to five years, adding to the four million sq ft already in operation. Spanning 2.5 million sq ft, with extensive landscaping and parks, the Nad Al Sheba community includes 1,500 four- and five-bedroom homes for lease as well as a clubhouse, community swimming pool and sports courts. Nakheel says it has become completely debt-free following full payment of its Dh4.4 billion ($1.2 billion) trade creditor sukuk which matures on August 25. The scheduled payment marks the end of the company’s financial restructuring, which began in August 2011, with all creditor obligations now fulfilled. Nakheel was one of the developers worst hit by Dubai’s real estate crash at the turn of the decade, forcing the firm into a massive $16 billion debt restructuring. The company says sukuk repayment follows a string of other Nakheel achievements and milestones over the last six years, including meeting the restructuring plan targets two years ahead of the scheduled five-year implementation programme, with savings of Dh25 billion ($6.8 billion); launching more than 70 new projects – ranging from neighbourhood retail centres to entire new communities – some of which are completed and operational while others are in various stages of development; and handing over 9,132 villas and apartments, and a further 1,923 land units to customers.